With last night's solid win against the Angels the Orioles secured their first winning month of the year and their first winning August since 1997. The Orioles, so far, have gone 15 and 11 this month with three games remaining. Not only is this month the only winning month for the Orioles thus far, it is the first time this year the Orioles have recorded more than 10 wins in a month. That is simply how bad the birds have been all year, looking at them now it really does feel like a different team. Having a strong August was very important for this team because in September the Orioles will enter schedule-hell. Thanks to the unbalanced nature of the schedule September sees the Orioles taking part in what amounts to a round-robin AL East tournament, one the Orioles have had trouble with this season. The clouds may be gathering on the horizon but the Birds of August are enjoying every last bit of sunshine this new life has brought. After only winning one game out of three in Chicago against the White Sox, the Orioles flew out to the West Coast to face the Angels. 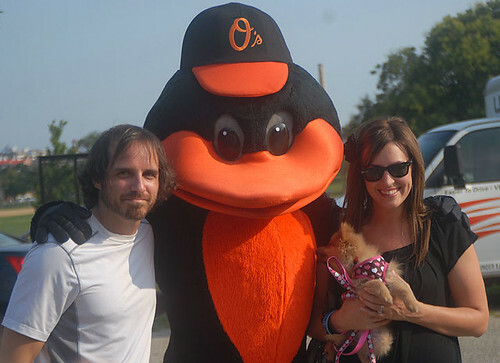 On Friday, the Orioles beat the Angels, 3-1, as Brad Bergesen bounced back from a so-so performance last weekend. He went eight strong innings, gave up a run on four hits, and kept the Angels off balance. Koji Uehara got the save. Baltimore got runs from a Nick Markakis RBI-single in the first, a Luke Scott RBI-single in the sixth and a Corey Patterson groundout in the eighth inning. The only run for Los Angeles came off a Bergesen balk in the first inning. Now that there are 33 games left in the season, what should we expect from here? It’s been a long season, but it’s good to have seen the team play much better overall under Showalter and actually play some competitive baseball. With Jim Johnson back in the fold, it’ll be interesting to see how he does during the rest of the season (Armando Gabino was sent down). However, Brian Roberts (hip) and Adam Jones (shoulder) are ailing a bit. Yesterday evening, baseball fans, kids, parents along with a strong representation of current and ex-Oriole players were once again on hand for Brian’s Baseball Bash. The event, in its fifth year, has a change of venue from downtown Baltimore to Dave & Buster’s at Arundel Mills Mall, but that didn’t stop hundreds from supporting a good cause and meeting the various celebrities in attendance. 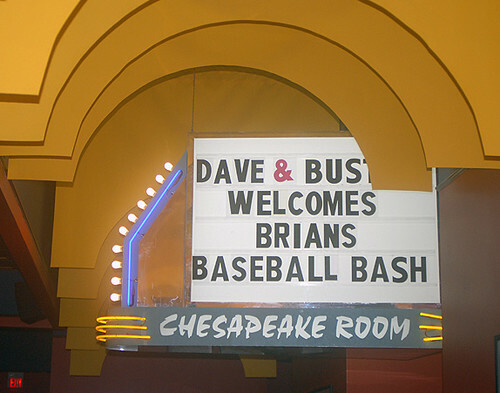 Brian’s Baseball Bash each and every year helps to improve the lives of sick children in the greater Baltimore metropolitan area and in the state of Maryland – primarily, the University of Maryland Hospital for Children. He and his wife, Diana, were hosts of the event and they spoke about their devotion to the community, their work with the hospital and plus were appreciative of the crowd that came out for the event. As most Oriole fans know who know all about the player, he is known for spending some of his free time during season in Baltimore visiting sick children in the hospital and doing his part to lift their spirits. It was quite an afternoon for Josh Bell in Baltimore on Saturday. Over the past weeks, some have wondered if Bell had been rushed up to the majors too quickly in light of his struggles; however, against Rangers’ ace Cliff Lee and in front of a National audience, he showed the promise the Orioles had in him. Yesterday, Baltimore beat Texas, 8-6, as they put on quite a power display. Bell has two homers off Lee and drove in five runs in easily his most productive day as a major leaguer so far, and Luke Scott along with Ty Wigginton hit back-to-back home runs to start a five-run, fourth inning. Brad Beregsen got the win, although he was not exactly at his best. He allowed five runs in seven innings of work on the afternoon, while Koji Uehara got his 1st major league save. It was a very frustrating Friday for the Baltimore Orioles as they lost to the Texas Rangers, 2-0, in the second contest of a four game set. 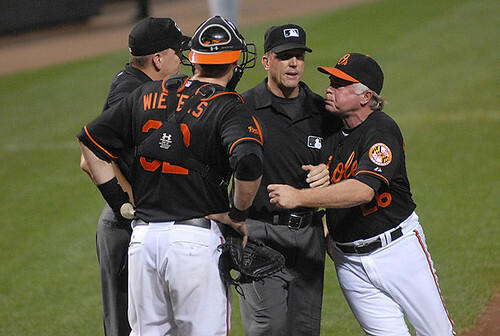 Nick Markakis got his first career ejection after arguing balls and strikes with home plate umpire Jeff Nelson; meanwhile, Buck Showalter too vented at Nelson later and found himself tossed – only after a memorable tirade that had shades of Earl Weaver written all over it. Then, the fans got into Nelson for the final few innings of the game attempting to get under his skin, booing, mocking cheers and saying sarcastic things. Seriously, Nelson’s strike zone was fairly questionable on the night and that in turn hurt the Orioles, but then again, C.J. Wilson – who on the night started for the Rangers on the mound – was brilliant. Overall, Wilson stymied the offense for 8 2/3 innings, allowed only three hits and struck out twelve. 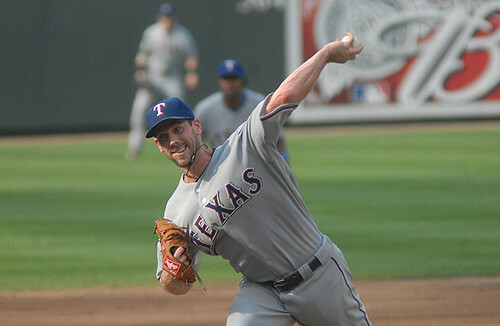 Of course, Nelson helped Wilson on the night, and the Rangers’ catcher, Taylor Teagarden sold the calls well. The Buck Bump, is it real - how long will it last? Before last night's win the Orioles lost two series in a row, two winnable series and Orioles fans everywhere began to consider the notion that the Buck Bump had passed and the Orioles would fall back into their old Pre-Buck (or P.B.) ways. Orioles fans can be a panicky bunch; after all 13 years of losing baseball will do that to you. Until the World Series parade starts on Pratt Street Orioles fans exist in a perpetual state of "waiting for the other shoe to drop". Let me be the first to say this O's fans: DON'T PANIC (notice the large friendly letters) the Orioles are still experiencing the influence of Buck Showalter and the bump is still in effect. Despite dropping back-to-back series to the Rays and Mariners the key thing to remember is the Orioles have been playing very solid baseball. The Rays are simply a better team right now and the Mariners - well - frankly the M's got a little lucky. It is not everyday that Matt Tuiasosopo pretty much wins a game single-handed. I still don't know how he caught Matt Wieters' double the other night and I bet he doesn't either. That is baseball even when you are playing well sometimes you just don't get the breaks. I stated a while ago here in this very blog that the real test of this team under Buck's tenure would be how they react to their first bit of trouble and last night I think they showed us. Brian Matusz was masterful against a very tough Rangers lineup and the Birds made easy work of the Texas Club shutting them out 4-0. It was just an excellent performance from everyone involved. 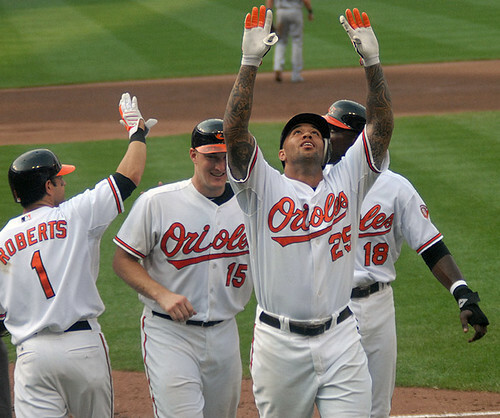 The Orioles are simply playing better ball and that usually translates into more wins. Every once and awhile good ballclubs lose games they have no business losing, like the third game of the Mariners series, but so long as the play remains consistent there good teams tend to win more games than they lose. Sitting here in the pressbox tonight, be sure to follow me on twitter (@hampden42) for live commentary and Q+A. this will be my third game of the season sitting with the rest of the press. I have to say everyone has been so very nice and welcoming to li'l ol' me. The Orioles are really going out of their way to open this experience up to the electronic media and I am thankful for the opportunity. After two disappointing losses to the Seattle Mariners in their three-game series this week, the Baltimore Orioles got a huge shot in the arm as Brian Matusz threw eight shutout innings as they beat the Texas Rangers, 4-0. They snapped a two-game losing streak, and used a four-run seventh inning to emerge victorious. Matusz – who had a season full of ups and downs – perhaps had his best showing in the majors so far on Thursday. On the night, he just allowed five hits and one walk against the Rangers – a team more than likely playoff-bound. We all know he’s got the stuff – the question is can he pitch with some consistency? Monday was a huge day for the Orioles as they not only beat the Seattle Mariner, 5-4, off an Adam Jones’ RBI-bunt that plated Nick Markakis for the winning run, but also signed a potential part of their future. After losing two straight against the Rays this weekend, the Orioles picked up the win last night and are now 10-4 under Buck Showalter, plus are 11-3 in extra inning affairs. O’s starting pitcher Brad Bergesen was solid on Monday, but nowhere as immaculate during his last start. He went 5 1/3 innings and gave up three runs. The bullpen kept the game in check until Seattle scored in the top of the tenth – that is until Baltimore scored in the bottom of the inning. The Orioles are 42-77 on the season. In all seriousness, the Orioles won their 9th out of 11 games since Buck Showalter took the helm of the team, as they defeated their American League rival, the Tampa Bay Rays, 5-0. The shutout on Friday was only the second on the year for the Baltimore. Jeremy Guthrie pitched six shutout innings and the bullpen – Koji Uehara and Mike Gonzalez – preserved the lead. Adam Jones had a two-run triple in the first and Felix Pie had a RBI-double in the first inning off James Shields – who started for Tampa and took the loss – for a quick three run lead. Josh Bell added an RBI-single in the fourth and Luke Scott hit his 22nd homer in the seventh (just imagine if he was traded). It’s good to see Uehara and Gonzalez healthy and productive – obviously, they both have had a tiny role in the surge of the Orioles as of late. As well, Luke Scott has not been in a prolonged slump for a good long while and has been hitting for the better part of two months. In fact, it would be safe to say that Luke has carried the team at times. Well, it’s good to see the Orioles are climbing in the loss column; however, the question I have is this – where was this team for the first 2/3 of the season? While I don’t think the success of Baltimore has been about Buck Showalter – it might be. He adds: "We know what he expects and we've played good baseball with him here. No magic formula, but maybe just a good shift in gears for us." Really. Could these guys not have as well as they have under Juan Samuel, or Dave Trembley? That’s confusing. Are these guys not professional athletes? Do they need that much extra motivation to win? Whatever is going on – it keep it up, but I’m perplexed. Last night's uniforms were awesome! In case you missed it the Orioles dug out their 1971 day-glo orange roadies for the game in TB. Un-effing-believable. Surprisingly they have been a bit polarizing I am seeing way too many people are hating on these uniforms frankly you all have a severe lack of both joy and style. These uniforms are awesome, certainly not something I would want to see everyday but I would love to see the Orioles bust these uniforms out once or twice a year. The Orioles keep rolling along with a nice, steady series win in Cleveland. The Birds did lay a bit of an egg in the series finale, just an uninspired effort and the umps certainly did not help the Orioles out either as many close calls did not seem to go their way. But looking beyond one very winnable stinker the Orioles continue their revival and travel to St. Petersburg, Florida to take on the Rays who are in the heat of a pennant race. The Orioles have already faced a first place team in the Chicago White Sox and they rose to that challenge very very well. The Orioles took three of four from that series and could have easily swept. Tampa however offers a different challenge; they have completely owned the Orioles this year winning seven of nine contests and most of them have not been close. But that was the old Orioles that was before the time of Showalter and this team is playing like a different team and people are noticing. The Orioles have been featured much more prominantly on national sports shows recently and it has been POSITIVE for a refreshing change, and that is nice. The Orioles lost to the Indians, 4-1, last night; however, it’s been a very, very good run for the black and the orange during the past two weeks. If anyone ever thought the Orioles would have an 8-2 stretch during the season considering everything that happened before Buck Showalter came along, they should play the lottery. Despite the loss on Thursday, Kevin Millwood looked a lot better than he did in the past few starts this summer. Who knows if his improvement is based on Showalter’s influence, being re-energized, or just feeling better, but Millwood is finally pitching as most thought he would. The offense finally got tied down, but it looks like with a healthy Roberts, a streaking Pie, and a lineup that finally seems to have it’s bearings in order. During the Cleveland series, I was most impressed by Brad Bergesen’s effort on Wednesday. The kid threw a two-hitter, gave up one run and rewarded the Orioles’ faith in him. Much like Millwood, who knows if Beregesen’s run of late is because of his fear of losing his job, luck, or just regaining his confidence – that being said, he looks like the pitcher we saw during stretches last year. If the Orioles continue their nice run and much less start to turn the tide within the next season or two, they’ll need youngsters like Bergesen to step up and compete. 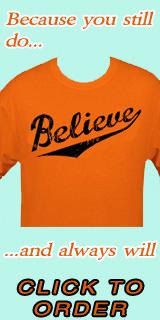 The Showalter era has gotten off to a great start, with last night's win the Orioles swept the Angels out of Baltimore. I honestly didn't recognize the team that played last night. Was that the Angels? I mean I know they wore Angels' uniforms but they played terribly this series moreover they weren't playing smart "Angel Baseball" that I know I have grown very accustomed to seeing over the better part of the last decade. The Orioles caught the Angels in free-fall and I will take it. The starting pitching has been wonderful this series Guthrie, Matusz and Arrieta combined to pitch 20.2 innings giving up six (SIX!) runs and only allowing two (TWO!) walks. Guthrie and Matusz both got wins. Arrieta had a remarkable start ruined by an eighth inning Torii Hunter 3-run homerun off of Jason Berken. Speaking of which, as great as the starters have been the last two games have seen the pen struggle. Matt Albers got lit up on Thursday night making a laugher a lot closer than it needed to be, David Hernandez struggled in the same game before spraining his ankle and ending up on the DL. Gonzalez has been reliable but he gave up an RBI last night while facing his only batter, but even with the struggles the Orioles have found ways to win the last few games. A Good Week for the Orioles; Showalter 6-1 as Skipper, Is It Luck or Skill? The Baltimore Orioles continued their winning ways in the Buck Showalter era as Brian Roberts hit a game-winning home run in the bottom of the tenth inning and led them to a victory over the Chicago White Sox, 3-2. They took three of four from the White Sox and are 38-74 on the season. Baltimore has won six out of seven, including three walk-off wins. Brian Matusz had a solid start, giving up a run in six innings of work and Koji Uehara pitched two shut-out innings. Alfredo Simon blew a save opportunity in the ninth, giving up a long solo homer to Paul Konerko to tie the game; however, Matt Albers and Mike Gonzalez held the White Sox bats at bay in the ninth and tenth innings. Ty Wigginton homered in the 6th for the Orioles’ first run, and Matt Wieters added another run in the frame when he grounded out to Paul Konerko on a fielder’s choice. Well, is the winning by the Orioles as of late all about luck? Really, the L.A. Angels aren’t nearly as formidable as they were last year and the White Sox probably just ran into a rough patch after an incredible two months of winning baseball. 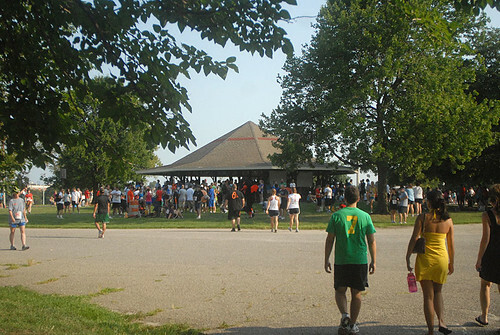 On Sunday evening, Oriole rightfielder Nick Markakis and his wife, Christina, hosted the second annual Right Side Foundation 5K Run and 1-Mile Fun Walk at Patterson Park in Baltimore, Md. The event raised money for the foundation and the proceeds wil go to disadvantaged and distressed children in the Baltimore region. 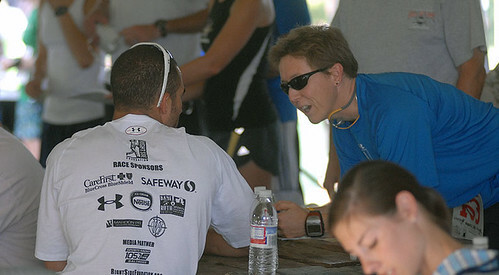 About 600 racers put on their athetic attire and racing shoes, or in some cases walking, to help out a good cause. At the end of the event, the top racers in their respective categories in the 5K race portion were handed a medal and the overall winners got a nice plaque honoring their accomplishment. Each participant got a bag and an Under Armour T-Shirt. During it all, racers - as well as fans who trickled in - got an opportunity to not only meet Nick and his family, but also second baseman Brian Roberts, hitting Terry Crowley, catcher Matt Wieters along with reliever Matt Albers. All signed autographs and got face time with their admiring public. The Orioles continued their winning stretch since Buck Showalter was named manager as they won again, 4-3 over the Chicago White Sox on Sunday. Although they suffered a close loss to the White Sox, 3-2 on Saturday, they bounced back nicely thanks to an ace-like effort from Jeremy Guthrie, who went eight innings and gave up only a run. His record is now 6-11, but he’s gone 3-1 with a 1.78 ERA in his last five games. They beat an always tough Mark Buehrle, who gave up four runs in seven innings and took the loss. Baltimore got a home run from Felix Pie in the first and took the lead for good thanks to back-to-back RBI-doubles from Nick Markakis and Ty Wigginton in the sixth inning. Up 3-1, Brian Roberts added a vital insurance run with an RBI-single. Alfredo Simon got his 17th save of the season, but it didn’t come without some drama. He gave up a long two-run homer to Ramon Castro in the ninth inning, but was able to retire Juan Pierre for the final out of the game. Speaking of Pierre, is there an issue between him and Guthrie – or was it the matter of the pitcher trying to take the inner half of the plate and the hitter being way too close? At the end of the day, what can you say about the Orioles? They are 5-1 since Showalter has taken the helm of the squad and there seems to some semblance of hope when it comes to improvement – granted, the team’s record is still awful. I don’t know if the Orioles’ improved play is based on some influence from Showalter or just luck; however, it’s been the matter of timely hitting, pitching and making fewer mistakes. Last night, the Orioles continued their winning ways as Adam Jones' game-winning RBI-single in the tenth inning helped them beat the Chicago White Sox, 2-1. Overall, it was a very well played game by the Orioles as Brad Bergesen pitched seven strong innings, only giving up a homer - a solo shot - to Gordon Beckham. The bullpen, mainly Koji Uehara and Alfredo Simon kept things in check, pitching scoreless innings. 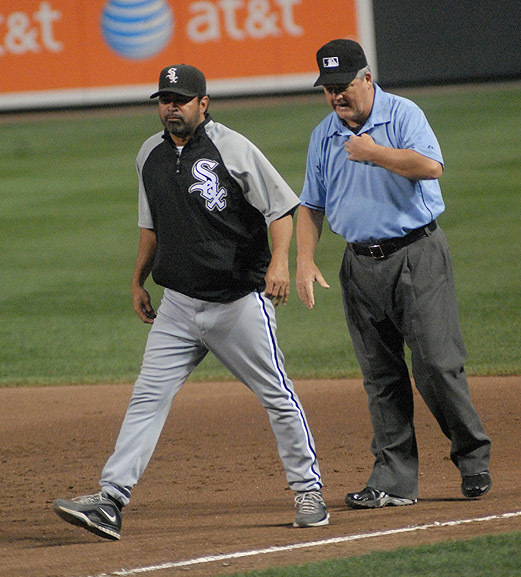 Showalter also showed his presence to the umpires out on the field as he engaged with Jerry Crawford for a bit in the seventh inning. The two men debated over a supposed catch that White Sox outfielder Carlos Quentin made in the seventh inning to rob Felix Pie of a hit. Last month, the Orioles swept the Texas Rangers in four games, and while everyone thought that might have been the start of something new under Juan Samuel - it was not. However, this time around with Buck Showalter at the helm of the Baltimore Orioles, things might be different. Not to give the lion's share of credit to Showalter, only after four games at the helm of the Orioles, but the players seem to be playing with a lot more urgency and perhaps accountability now. They are undefeated with him on the field right now. It’s three games into the Buck Showalter era and Orioles have won each one. Last night, the Orioles swept the three game series with the Angels as they won, 5-4, thanks to a walk-off hit by Cesar Izturis in the bottom of the ninth inning. The difference in the team during the Angels series has been obvious – the young starting pitching has been a lot better, the Orioles are hitting in the clutch, performing with runners in scoring position and aside from the bullpen faltering in game two, the team has been solid. The Orioles nearly blew Wednesday’s and last night’s game – but hey, at this point, win any way you can. After the train wreck we’ve all seen this season as fans, it’s nice to have a little win streak going into a tough weekend series against the Chicago White Sox. Then again, the Angels are not nearly good as they have been in years’ past and look to be nothing more than a .500 team. Yes, it is one three games into Showalter’s tenure in Baltimore; however, the team seems to be responding to his style and playing much differently. It’s the same team that we’ve all seen during the past month – however, right now it’s all good. Yesterday was the 106th game for the Orioles on the season; however, the feeling was a different at Camden Yards last night. 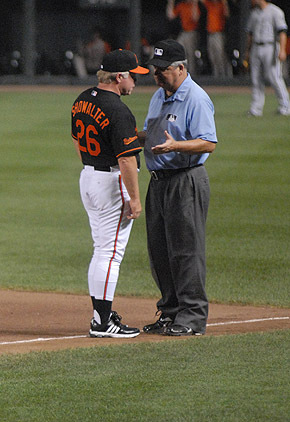 New Oriole manager Buck Showalter got his troops to defeat the Angels, 6-3, last night at Camden Yards. There was a little less than 17,000 people at the park, but they greeted Showalter warmly and hope he can help be part of the turnaround with the organization. The Orioles are now 33-73 on the season. Jeremy Guthrie got the win as he went seven innings, gave up three runs and finally got some ample run support on the evening. Reliever Mike Gonzalez continued on his road back by pitching 1 2/3 no shutout ball, and Alfredo Simon things up. The Angels got on the board with a Howie Kendrick two-homer in the 5th inning; however, the Orioles got on the board with a Matt Wieters RBI-double in the bottom of the 5th. They took a 3-2 lead as Luke Scott hit a two-run homer in the 6th (his 19th on the season). A few batters later, they added an insurance run as Josh Bell added a two-run double and secured their advantage. Baltimore added another run in the eighth off a Wieters RBI-single that floated to left. Overall, it was a good night for the Orioles. One game does not make a season and you can’t judge much from Showalter’s first game, but the team played a lot differently and made far less mistakes than usual. Plus, for once I felt a little less afraid about Baltimore blowing a lead. As for Showalter, I feel good that the team has someone of his caliber and experience at the helm. As you all know out there in Birdland, the Orioles formally announced Buck Showalter as the 17th manager in team history on Monday. Showalter said all the right things and also came off very well in the presser for the media yesterday. The fans are excited and hoping for change after 13 seasons, plus thinking that Showalter will light a fire under the players. He’s got the experience, the nice lifetime record and respect throughout baseball – we know that. From what I’ve read, heard and seen so far, it looks like Buck – for all his faults – is a very good leader and someone everyone will respect. Maybe Buck restores the Orioles back to prominence in Major League Baseball, or maybe like every manager since 1998, he may fall on his face. Showalter also did a very classy thing – he will don the number 26 in honor of the late Johnny Oates who he considers a ‘friend and mentor”. Furthermore, it looks as if he’ll make his home in Baltimore and do his best to change the culture within the organization. It was all wonderful on Monday amongst Oriole fans on the radio, on the web, blogs and wherever else; however, we’ll all head back to reality as the 32-73 Baltimore squad continue a sad season against the Los Angeles Angels of Anaheim at Camden Yards later on today. Buck Showalter was announced as Orioles manager today. The skies parted, the sun shone down from the heavens. the Warehouse was bathed in an ethereal glow of life-giving light. Suddenly, for just a moment, the world was at complete peace. Not a gun was fired, not a cannon shot. There was not a raised voice because if you listened just ever so carefully you may have heard a solitary angle singing a quite, respectful, hymn. Or there was a press conference. Yeah, there was a press conference. If you missed the big presser catch it all on MASN's website and really solid quotes from Brit and Roch. What did I take away from today's events you ask? Honestly I'm not really sure. I have spoken on the Showalter enough: I think it is a great hire. 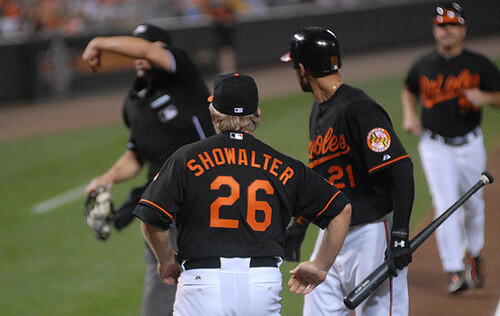 I think Showalter brings instant credibility ... I've been over this. Nothing about today's presser changed my mind Showalter is obviously the guy you want in this situation. He is a proven leader and a proven franchise architect and the Twisted Pagan Baseball Gods know that the Orioles need all the help they can get. Honestly, I am not really expecting drastic changes in the short-term I really don't know what some Orioles fans are expecting to find here. I think some fans have this idea that Showalter is going to go all "Bull Durham - Shower Scene" on the first day. Walk into the clubhouse with a Shatner-esque swagger and get things done. And for all I know, maybe that is the case. But don't be surprised when he doesn't go Earl Weaver on an Ump on the first bad call and don't lose faith when he doesn't seem to visibly dress down a player for not properly running out a fly ball or making a silly error. I think Buck understands that this is a job that needs to understand the long-view. Oh, I am sure that Buck will bust some heads from time to time that is the type of guy he is but I don't think it will be as visible or the reality will match the picture that some have built in their heads. On Sunday, August 22nd, Brian Roberts will be holding his fifth annual “Brian’s Baseball Bash” at Dave and Busters at Arundel Mills Mall. The blog can certainly attest if you’d like to meet some of the Oriole players, get face time, autographs and just have a good time, this event is for you. Of course, ‘Brian’s Baseball Bash’ is for a good cause – to help the University of Maryland Hospital for Children and all proceeds will go towards that foundation. Admission is $200 per person and $150 for children 12 and under. This includes complimentary parking, a Dave and Buster’s game card, dinner, desert, cocktails, the opportunity to interact and receive autographs from Orioles players along with local celeberties, giveaways plus access to live and silent auctions. For more information, check out the University of Maryland Hospital for Children's website by clicking here.